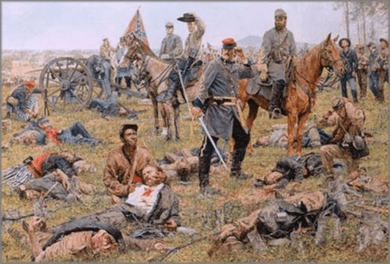 Bradley Schmehl limited edition print:"Grim Harvest of War, The"
About the Art:Blazing with the fire of combat, Jackson rode onto the coaling. He congratulated Taylor and promised him the captured guns. The enemy staggered, but it didn't break. They preserved formation even as they left the field along the road to Conrad's store - pressured all the while by Taliaferro and Winder. Tired after the last few days, the Southerners were not able to pursue rapidly - the infantry pounded out four or five miles and the artillery pushed a few miles farther. The spoils included about 450 prisoners, 800 muskets, one more cannon and some wagons. "Ever laconic, Jackson dispatched a one-sentence telegram to Richmond advising, �Through God's blessing the enemy near Port Republic was this day routed with the loss of Six (6) pieces of his artillery. '�Long after the war Richard Taylor recalled, "I have never seen so many dead and wounded in the same limited space. ** In the painting, The Grim Harvest of War, the artist chose to show Major Wheat in uniform, but not "bloody as a butcher". Southern casualties:816 killed and wounded Union losses including prisoners:800-1000 Area of the coaling:less than 1 sq. mile. BRADLEY SCHMEHL Bradley Schmehl is an artist with a love of history and a passion for the Civil War. Ideas for paintings come to the artist through reading history books, the diaries and letters of soldiers, visiting battlefields and historical sites -- and most importantly, talking and exchanging ideas and information with the many interested and interesting people who share his sense of history. Each of his paintings requires extensive research. He begins with a rough pencil sketch, usually done on location of the actual site or battlefield. Models are engaged to pose as various characters in the picture, then photographed. Once Schmehl is satisfied that his concept is historically accurate, he begins the actual painting process. No thank you, I just want the unframed print.